Even while sitting among them Europeans just can’t stop themselves from insulting Africans. AFRICANGLOBE – French Prime Minister Manuel Valls issued an appeal on Sunday for Africans to get over the legacy of slavery, dismissing claims for financial compensation while acknowledging the “horror” of the slave trade. 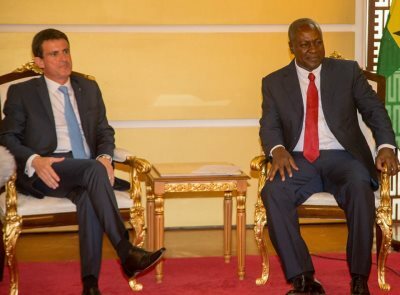 Valls was visiting Franklin House, a former slave hub in the Ghanaian capital Accra, on Sunday on the second leg of a three-country tour of West Africa. “We cannot repair slavery but we can prepare the future” he said in an article published by the French daily Le Monde and the English magazine The Africa Report. Valls rejected the idea of compensation, instead advocating for strengthened trade relations between Africa and Europe. “It is not so much about living for the idea of reparation… as about looking to tomorrow, about strengthening the ties between our two continents on either side of the Mediterranean,” he said. But Valls argued against calls for reparations, rejecting the idea that Africa’s history is solely defined by slavery. “Memory should not divide. It should, on the contrary, close fractures and bring people together, if only we do not give in to the awfulness of competing memories, hierarchies and comparing the suffering of some with the misfortune of others. French President Francois Hollande on a May 2015 trip to the Caribbean spoke of the debt France owed to Haiti, but his office later said he was referring to a “moral debt” rather than financial compensation. France abolished slavery in all its colonies in 1848 but only recognised slavery as a crime against humanity since 2001. Valls, who arrived in Ghana on Saturday from Togo, heads later Sunday to the Ivory Coast.